^ Lavery and Jordan, pp. 2-5. ^ Wright and Magner, p. 119. ^ Lavery and Jordan, pp. 25-32, 37-38; Gibbon 1994, pp. ix-xi. ^ Wright and Magner, pp. 126-27. Gaff, Alan D., On Many a Bloody Field: Four Years in the Iron Brigade, Bloomington, Indiana: Indiana University Press, 1999, ISBN 978-0-2532-1294-8. Gibbon, John, Adventures on the Western Frontier, Alan D. Gaff and Maureen Gaff, eds., Bloomington, Indiana: Indiana University Press, 1994, ISBN 0-2533-2579-X. Haskell, Frank A. The Battle of Gettysburg, Military Order of the Loyal Legion of the United States Commandery of the State of Massachusetts, 1908. Herdegen, Lance D., The Men Stood Like Iron: How the Iron Brigade Won Its Name, Bloomington, Indiana: Indiana University Press, 1997, ISBN 978-0-25333-221-9. Lavery, Dennis S., "John Gibbon", Encyclopedia of the American Civil War: A Political, Social, and Military History, Heidler, David S., and Heidler, Jeanne T., eds., W. W. Norton & Company, 2000, ISBN 0-393-04758-X. Lavery, Dennis S. and Mark H. Jordan, Iron Brigade General: John Gibbon, Rebel in Blue, Greenwood Press, 2003, ISBN 978-0-3132-8576-9. Nolan, Alan T., The Iron Brigade, A Military History, Indiana University Press, 1961, ISBN 0-253-34102-7. Wright, Steven J., and Blake A. Magner, "John Gibbon: The Man and the Monument", The Gettysburg Magazine, Issue 13, July 1995. Felton, Silas. "The Iron Brigade Battery: An Irregular Regular Battery," in Giants in their Tall Black Hats: Essays on the Iron Brigade. Alan T. Nolan and Sharon Eggleston Vipond, eds. Bloomington, IN: Indiana University Press, 1998, ISBN 0-2533-3457-8. Gaff, Alan D. and Maureen Gaff. "'The Dread Reality of War': Gibbon's Brigade, August 28-September 17, 1862," in Giants in their Tall Black Hats: Essays on the Iron Brigade. Alan T. Nolan and Sharon Eggleston Vipond, eds. Bloomington, IN: Indiana University Press, 1998, ISBN 0-2533-3457-8. Gibbon, John. Gibbon on the Sioux Campaign of 1876. The Old Army Press, 1970. Gibbon, John. Personal Recollections of the Civil War. New York : G.P. Putnam's Sons, 1928. Gramm, Kent. "'They Must be Made of Iron': The Ascent of South Mountain," in Giants in their Tall Black Hats: Essays on the Iron Brigade. Alan T. Nolan and Sharon Eggleston Vipond, eds. Bloomington, IN: Indiana University Press, 1998, ISBN 0-2533-3457-8. Hartwig, D. Scott. "'I Dread the Thought of the Place': The Iron Brigade at Antietam," in Giants in their Tall Black Hats: Essays on the Iron Brigade. Alan T. Nolan and Sharon Eggleston Vipond, eds. Bloomington, IN: Indiana University Press, 1998, ISBN 0-2533-3457-8. Nolan, Alan T. "John Brawner's Damage Claim," in Giants in their Tall Black Hats: Essays on the Iron Brigade. Alan T. Nolan and Sharon Eggleston Vipond, eds. Bloomington, IN: Indiana University Press, 1998, ISBN 0-2533-3457-8. Wright, Steven J. "John Gibbon and the Black Hat Brigade," in Giants in their Tall Black Hats: Essays on the Iron Brigade. Alan T. Nolan and Sharon Eggleston Vipond, eds. Bloomington, IN: Indiana University Press, 1998, ISBN 0-2533-3457-8. 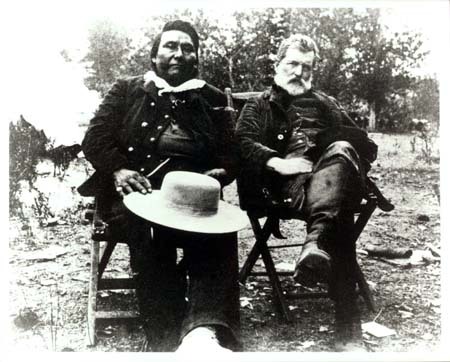 Photograph of Gibbon in 1889 with Chief Joseph. Photographs of Gibbon and his grave. "Gibbon". Find a Grave. Retrieved 2009年1月25日.